I wish you lived closer because Tacoma is so good to me. I would love to share its goodness with you, but, alas, you live so far, far away. The Spaceworks Gallery with my Strata Discs hung second to right in right window. Remember when I told you that I was going to Denmark this summer? Well, I did! 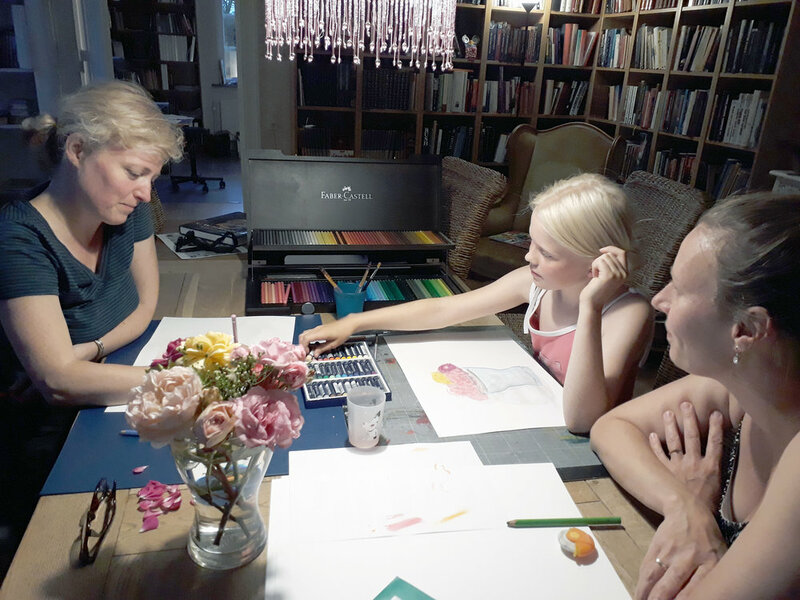 My dear friend, Mette, in Denmark, has been chatting with me about creating artwork for her family's home since 2006. I know, long time--over 10 years! But this year we made it THE year! The first leg of my trip included 3 nights stay in Reykjavik, Iceland at the Reykjavík City Hostel. What did I do the most: spent daily hours at the Laugardalslaug thermal pool, just a few minutes away from the hostel. Heaven, especially the pool with geothermal ocean water. 2006 was the last time I visited Iceland. I was with 5 other Icelandic relatives and, wow, Reykjavik has changed. There was so much more tourist this time around! Almost every sign was in English along with an Icelandic version, sometimes with the English version first. I also had trouble finding hand-knitted items that were actually crafted by Icelanders. After I mentioned this to Icelandic friends they confirmed my suspicions: most of the knitting is done outside of Iceland, by non-Icelanders outfitted with patterns to follow. I'm guessing, with little doubt, that the rate of return is higher this way. After hours of meandering searches, I did find a woman with hand-knitted items in the plaza on Austurstræti and Lækjargata. We had a wonderful conversation, once I told her where some of my Icelandic ancestors lived :) She informed me there were more tourists (mostly summertime) in Iceland than Icelanders. Very concerning. And I believed her. Next, I spent 10 glorious days experiencing Mette's life, including her life with her two lovely children in Lyngby, a northern suburb of Copenhagen, Denmark. How did we meet? I lived with Mette and her family as an exchange student in 1988-89. Mette and I in 1988 in downtown Copenhagen. Mette and I in 2017 at the Queen's Castle in Copenhagen. On this trip, the first time back since 1989, we walked, talked, biked, swam, ate, drank, and laughed. We jumped into her car and toured through Zealand, Funen, and Jutland visiting friends, camping, picnicking, walking, morning bathing in the ocean and laughing more. Picnic on the side of the road, next to the Nakkebølle Fjord. Car camping at the Nørre Lyngvig Campground. 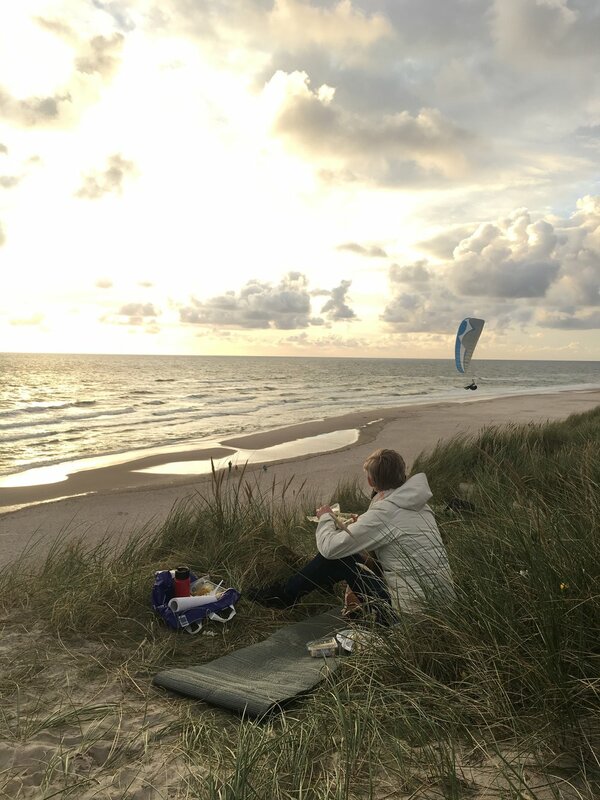 Sunset picnic on the shore of the North Sea. Mette and I on top of the Nørre Lyngvig (lighthouse). Mette took a photo of me on the way down through the lighthouse interior. So many coinkydinks happened each day that I soon was asking Mette, 'Did you plan that?' Then we'd break down, laughing and laughing. For example, while visiting Vadehavscentret in Ribe, Queen Margrethe II walked by, only about 1 foot away from us. She was museum touring with around 6 people and if Mette had not pointed out who she was I would have thought she was just another museum visitor. I'm SURE Mette planned it! It was a gorgeous place. Something Mette definitely planned was a visit with her long known friends in Havnbjerg. After a beautiful evening of delicious drinks and food, their daughter, Sophia, a young, inspiring artist, asked if I'd like to draw with her. She had an elaborate water-soluble color pencil set and a soft colored bouquet she designed earlier that became our perfect still-life. I have never been around a young person with such determination, such a hunger and willingness to learn. While we drew together she asked me why I did certain things--through translations from her supportive mother--and she never lost her concentration. Blown away by this person! Enjoyed every moment with this family. Me, Sophie, and her mom, Stine. Me and Sophie quietly drawing together. Sophie and her younger sister, Ina, pose with Sophie's gorgeous artwork. AND she gifted it to me! A treasure! I'd love to keep writing and describe what we did every day--the new Moesgaard Museum, MOMU, was amazing and the Louisiana was still as wonderful as in 1989-- and who I saw--like Mette's family, especially her dad who I haven't seen since 1989!-- but this would belabor our main travel abjective: in exchange for a flight to Iceland and Denmark, I will send Mette 5 of my Strata Discs. And the award, with its show at the Spaceworks Gallery, prompted me to complete 4 of the 5 discs for the installation. Some even traveled with me on this trip! 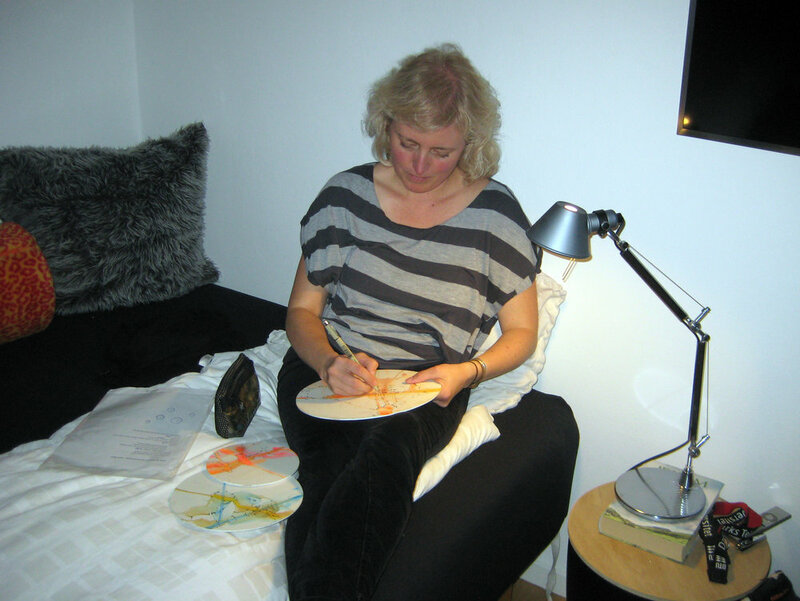 Drawing in the evening on the discs I brought with me to Denmark. Thank you, Mette, for a beautiful trip!!!! Back home, I worked non-stop to complete the 4 discs for the show. Each one contains specific imagery to be included within their strata, symbolizing ideas precious to her and her children. The soil we walk upon is teeming with gazillions of tiny, unseen critters, with one gram containing as much as 5,000-7,000 bacteria species. And most people don’t even realize it. Most of my work revolves around those critters seen or unseen and the environment surrounding them. 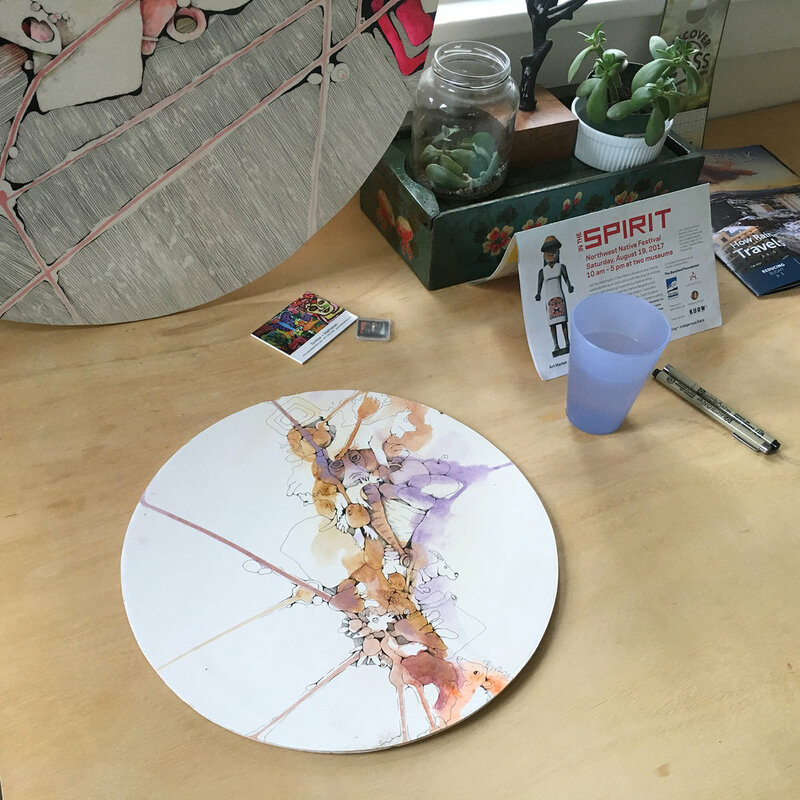 Each completed piece becomes a decomposing, creature-filled and impermanence abiding environment soon to crumble into soil. It’s what all matter eventually becomes--layers of history. I like to imagine what a cross-section of this strata could contain—perhaps fictional frolicking creatures, colorful minerals, objects that have been disposed of or demolished, all of them past memories embedded within deposited layer. More lines drawn with my favorite pens, Pigma MICRON. 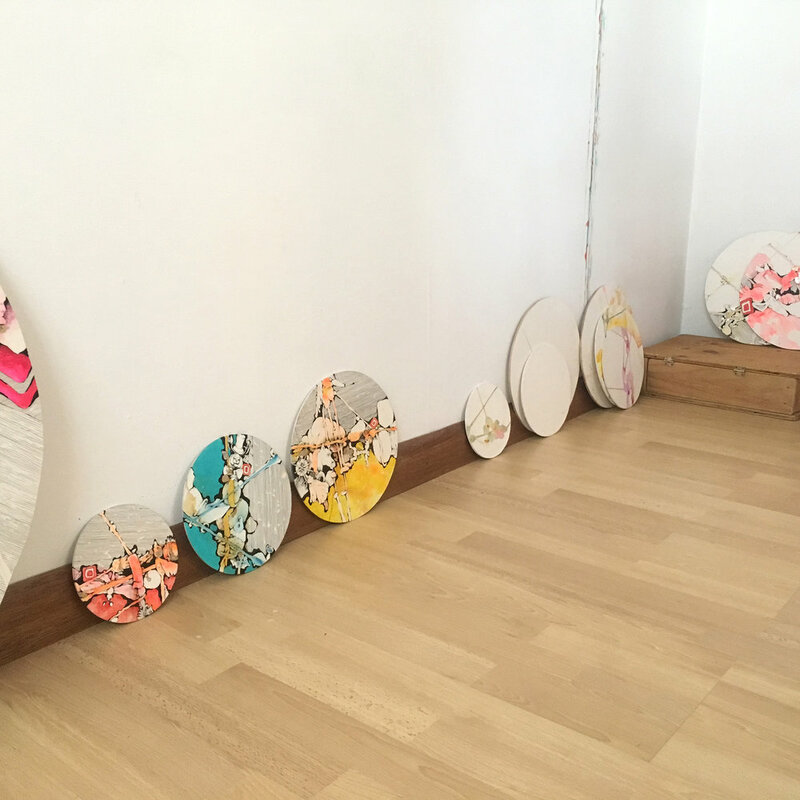 Almost completed discs sitting next to uncompleted discs on my studio floor. Sunset, acrylic/ aluminum leaf/ dutch metal leaf/ ink, 14" X 14"
Sky, acrylic/ aluminum leaf/ dutch metal leaf/ ink, 8" X 8"
Sunrise, acrylic/ aluminum leaf/ dutch metal leaf/ ink, 6" X 6"
Sunshine, acrylic/ aluminum leaf/ dutch metal leaf/ ink, 10" X 10"